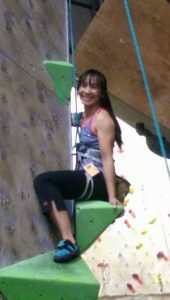 2018 Sport & Speed Youth National Championships indoor Rock Climbing Competition was at Stone Summit in Kennesaw, Georgia (July 12 – July 15). It was a four-day competition with Thursday and Friday being the qualification days, Saturday as semi-final round, and Sunday as the final round. I had an opportunity to volunteer as a top rope belayer for Friday through Sunday. It was a fun and interesting experience. I learned a lot about what it took to top rope belay at National competition level. I thought top rope was going to be a breeze but it was quite the contrary. Being alert was key. There were excitement and anxiousness in the air. The competitors were excited and sometimes overlook safety check or failed to buckle in their harnesses safely. It was up to the belayers to fill the gap of redundancy safety checks and verification. The belayers were the anchors for all climbers. We stayed calm and create a safe space for the climbers to proceed and focus only in their climb. 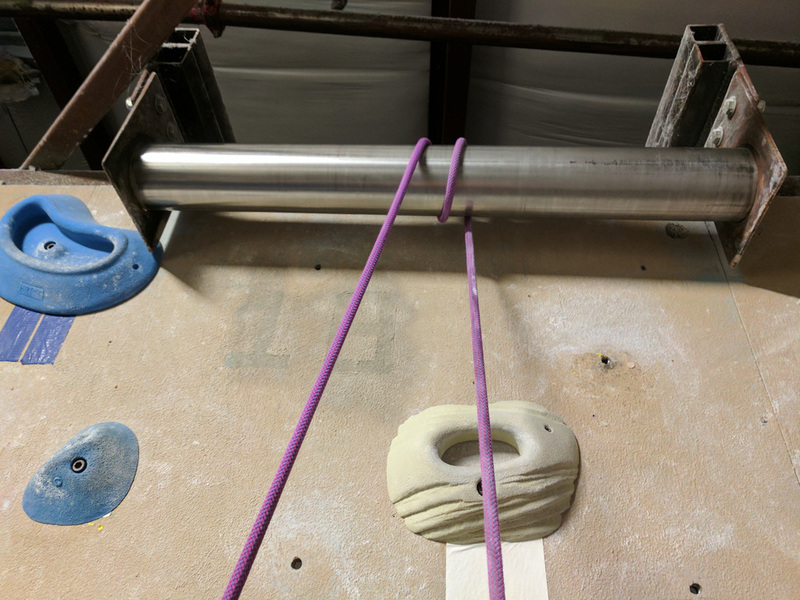 There were two types of belayers: Lead and top rope. All belayers must be certified or verified by the climbing gym before he or she can belay. There are two belayers assigned to a route. For top rope, one to clip in the climber and the other to belay the climber. The belayers can switch out to support one another. For lead, the second belayer stand-by to support the first belayer when needed. The lead belayer belays climbers who lead climb up a route. Lead climbing is an advance climbing where a climber has their own rope to lead up a route. At the National Championship, there were existing 8 to 10 quick draws hanging from each bolt anchored to the wall from the bottom to the top of a route. The number of quick draws may varies from gym to gym depending on how high the lead climbing wall would be. The climber clips the rope to the quick draw. This support the climber from falling far below the roped clip. The job of the lead belayer is to thread the rope up to the climber as needed to clip into the quick draw, catch the climber when fall, and lower the climber to the ground when completed. He or she also check with the climber to make sure the climber is tied into rope properly. The climber also verifies the belayer’s belay device safely connected to the rope. The lead belayer is the anchor to the ground for the climber. He or she also controls the proper rope tension so the climber can climb and clip the rope into a quick draw with ease. The belayer does not want to hold the lead rope too tight because it could easily pull the climber off a hold or restrain the climber from pulling the rope up to clip in. There should always be adequate slack between the belayer and the climber. The top rope is where the rope is looped at the top and the climbers tied to one end of the rope, connect to a harness, and climb to the top as far as they can while the belayer at the bottom tied to the other end of rope. The belayer catches the climber when the climber falls and lower the climber to the ground. 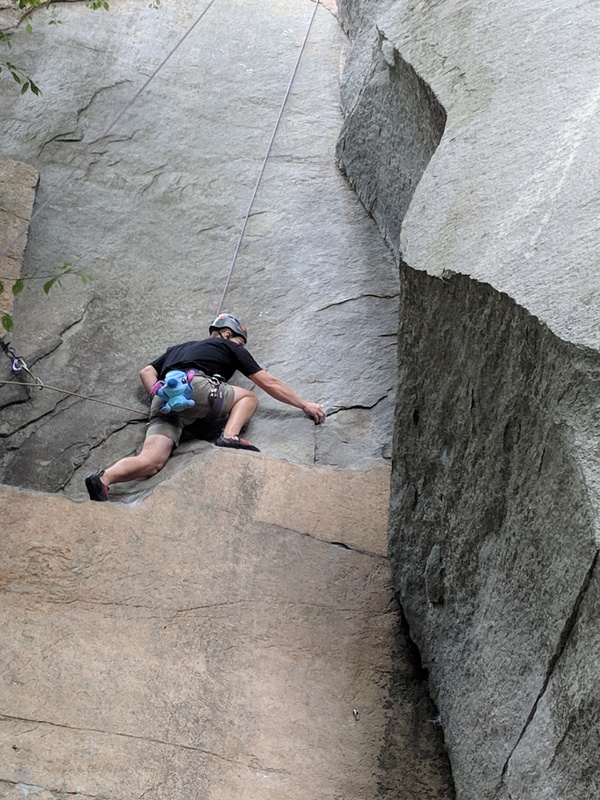 As a top rope belayer, there is a balance of having the rope slightly tight on the climber end to the loop at the top while having slack from the belayer end to the top so that the rope does not pull up the climber. Sometimes it is hard to see where the rope is when the climber blocks the rope view. It is a constant dance to keep the climber on the right balance with the rope. One of the top rope belayer challenge is when the climber has to climb up an incline or an overhang section. The belayer has to have a certain slack on the rope so it does not pull the climber off a hold. The rope sometimes end up wrap around the climber’s neck or go to the back of the climber. Those are the two scenarios we work hard to keep to a minimal. However, it does happen now and then. The belayer strive to keep a certain slack and tension on the rope. While It is up to the climber to move the rope away from the neck or bring the rope around to the front of the body. Lowering the climber to the ground with care is also important especially on an overhang. The climber will have a tendency to swing like a pendulum when fall. A clipper is the second or back up top rope belayer. He or she clips and un-clips the rope from the climber. The clipper has the climber and belayer double check each other harnesses, rope, and belay device and make sure everything is functioning safely. He or she also verifies with the judges that they are ready for the new climber. All the walls were at least 50 feet tall and some walls were also steep with an overhang. When a climber falls he or she will pendulum. The last thing we want is for the climbers to swing into each other when they fall especially on top rope. climb up close to the clip, they un-clip the rope and continue to climb. The clipper also notifies the climbers about the clip if there is one on the route and to un-clip the rope before they pass it. After the climber complete the route, the clipper help the wall clipper to re-clip the rope to the special clip under the overhang for the next climber. The wall clipper is the person that specialized only clipping the rope back to the special clip location using an 18-foot pole. There are possibilities of many things that could go wrong if we are not alert and do a multi check on climbers and belayers. At a national meet, we strive to keep everyone safe, have a good time and minimize negative scenarios. Safety with professionalism is the key component. A climber or the coach can call a technical on the climb because of a rope issue. Technical is a term that is being used when there is a technical problem with a climb. A technical can include climbing hold is loose, a rope is too loose or too tight or anything else technical that could prevent the climber from climbing safely or easily. The rope is assisting a climber to reach for the next move when the rope is too tight. Climber has a false start when the judges were not ready for them. The climber can swing and hit another climber. Although being a belayer was a volunteered position, it was still taken very seriously. Climbers trust the belayers to be the anchor for their climbs. The belayers kept climbers safe and secured to climb with ease. Whether the position was for a lead or top rope, they were both treated equally important in managing a smooth competition. Our belayer team rocked. I participated in a successful 2018 National Sport and Speed Competition. Everyone had fun time, climbed hard, and received a wonderful experience. I hope this article is helpful in understanding what it takes to belay at the National Level. Have you participated in a rock climbing competition before? If there are questions or suggestions, please leave them in the comments below. I would love to hear your thoughts.